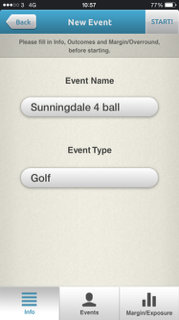 On the main screen once you have selected the "Be a Bookie" button you will be prompted to enter the event name and type. The next tab should contain the outcomes and your estimate of their win probability. This should, but doesn't have to, add up to 100%. Once you have completed the entrants, enter your margin/over-round in the next page as well as the Each way terms, if applicable, and your maximum exposure. The margin will swing the odds in your favour and the maximum exposure will help you to manage your risk. 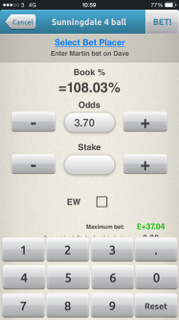 When you press start you are taken to the page that shows your outcomes and the starting odds, taken from the probability and the margin percentages. Through social media at the bottom of this screen you can invite others to get involved and place bets. To do this press the odds next to the outcome. This will show you the bet placement screen. 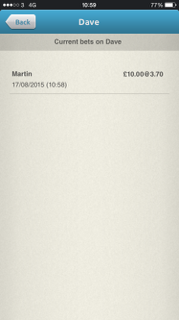 To select/enter the name of the person placing this bet press "Select Bet Placer". 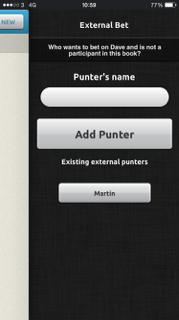 This takes you to a new screen that allows you to enter the name of the punter. Once the name is selected you return to the bet placement screen. The odds field is pre-populated, though you can adjust the odds if you wish by over writing them. You can see the Book % change as you do this. It displays an increasing or decreasing margin. If you just wish to change the odds, to manage the book percentage, you can do this by leaving the stake field blank and pressing "Bet!" in the top right. The Maximum bet is displayed at the bottom of the bet placement screen. A positive number shows how much can be taken at the odds in order to stay within the maximum exposure limit. A red number indicates you have gone over your limit. 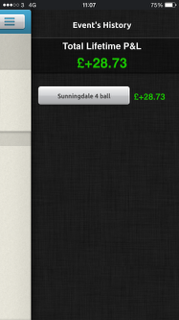 The Payout including stake for this bet, is the win part of the bet payout only, on the odds and stake entered. 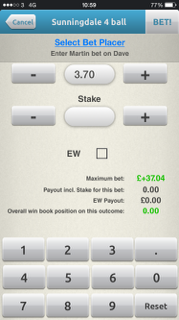 If EW is ticked then the EW Payout is also displayed. Below this is the win book position on the outcome. Here you have the overview of the event. You can see your winbook Expected Value (EV) is in the top left of the screen. Your maximum exposure is also displayed at the top. The payout button has a drop down arrow where you can choose to see the Payouts/Positions from three angles: "Win book", "EW book" and "Combined" which needless to say combines the win book and the EW book. Running down the right hand side of the outcomes is the "Payout" this is how much has to be paid out to a punter on any one Outcome. Within the outcome box is your position on each individual outcome. Green is a positive position and red is a negative one for the user. This shows how much money you will make or lose on the outcome. 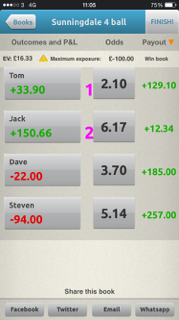 Again "Win book", "EW book" or "Combined" are displayed here depending on your selection from the "Payout" drop down menu. 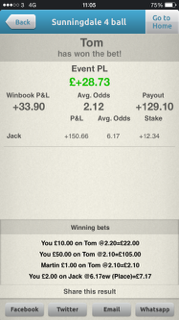 Clicking on an outcome will display the details of the current bets on that outcome. You will see who placed the bet, when and what the odds and stake were. 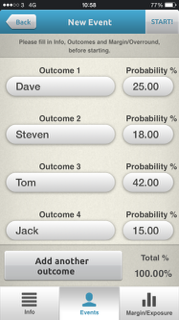 The user can adjust the odds in order to manage their book. To do this enter the bet placement screen as normal. However, just change the odds and press "Bet!". You can see how the odds change affects your overround before you place bet. You can shorten odds on an outcome if you feel you have had too many bets on it. Conversely you can lengthen the odds of others to try and encourage more bets on those outcomes. An event is ended by pressing the "Finish!" button in the top right. If the event is win only then the user only has rank one outcome via drag and drop. 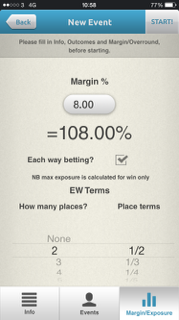 If the event has had EW betting then the user will have to rank as many outcomes as there are EW places paid. A way of calculating the overround and reverting % to odds. Set your odds: This allows you to set odds similar to be a bookie however, without the risk management and bet history.